Chances are that if you own a truck or are considering buying one, it's partly for its usefulness in towing. Whether you want to pull a camper on a road trip or just need to attach a trailer for a quick trip to the landfill, there are some simple tips for getting the most out of your truck's hauling capacity. Have your vehicle's towing capacity in mind before buying a camper. The two vehicles must complement each other or a number of safety issues will arise. 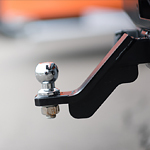 For more stability, you'll also want to use a hitch that ties in to your vehicle's frame rather than one attached to the bumper. You can also add a cold-air intake to your engine to increase its efficiency. If you aren't sure of your truck's hauling capacity or are thinking of buying a truck to tow a load, don't hesitate to visit us at Midway Ford Truck Center. We can help you to ensure your present vehicle is ready to tow or set you up with a test drive of a truck sure to meet your needs.